With traditional Aramaic mantras and dances, we create a sacred space and experience the divine vibrations within us. Life is vibration! For that, vibrations of all kinds, like the voice, playing instruments, e.g. are powerful, and therefore a wonderful starting point to experience life, to become healer from within. On certain points in the seminar we will start approaching the divine soul directly by speaking and singing ancient Aramaic rituals that have been practiced for more than 2.000 years. Truly feel your own needs, your own being, and dive into the eternal memory of your divine soul, to strengthen your very own intuition. This workshop is dedicated to all who want to experience a deeper connection to themselves and others. The spiritual beliefs taught in this seminar are universal and not attached only to the Christian belief. 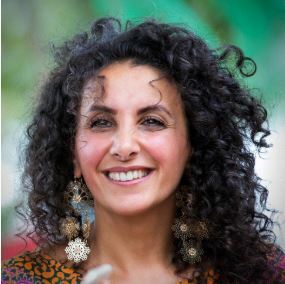 Maria Kaplan is an Aramaean singer and therapist, who lives and works in Germany. The sound of this archaic language, the warmth of her dark, soft yet powerful voice, and her soulful devotion to the inspiration of the moment, will find its way directly into the heart of the listener. She combines ancient traditions with her own modern spirituality in her Aramaic singing. Please bring: comfortable clothes, yoga mat, beach towel or larger towel, seat cushion, blanket, notebook (writing utensils). Sufficient water to drink regularly during the workshop.